By Jim Donten on 7/17/09. 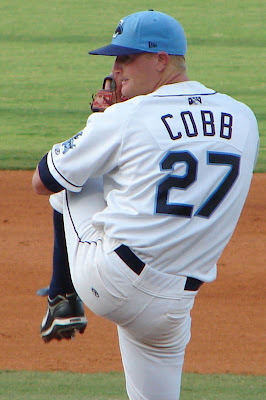 Speaking of that, it was enlightening to talk to Alex Cobb about the pitches he threw. He appeared to be throwing both a cutter and a split-changeup last night. One faded, the other ran to the glove-side. Turns out, as Cobb told us, both of those pitches are splitters. It's just that he sometimes cuts the splitter by keeping one of his fingers on it longer. Thus he had two versions of his changeup, and that allowed him to move the ball all around the plate while keeping hitters off-balance. I don't recall seeing much of that cut-splitter before. It's something to keep an eye on as the season progresses and Cobb, like Hellickson before him, tinkers with his repertoire in order to polish it for his inevitable next call to the major leagues. Would like to see Cobb replace Gomes in the Bigs. I forgot to say that I'd also like to see Cobb replace Gomes or Badenhop----just get Cobb up there! I think we'd all like to see him back in the majors, for good this time. He just happened to be a year behind a ROY (Hellickson) and the #1 prospect in baseball (Moore). Absent injury he won't knock Price or Shields out of the rotation, so it's either Niemann or the bullpen. One thing Cobb always reminds me of is not to overreact to a rough transition to full-season ball. When he went to Columbus in 2008 he jumped almost 60 IP and gave up a ton of HRs while having his lowest career strikeout rate. Since then he's kept the HRs down and become a pretty good SO pitcher to go with his low walk rate. He's alway hittable, but consistently good. Another thing is he's never pitched more than the 139.2 innings he did in 2008. In past years he'd miss time with minor things like recurring blisters, and more recently he's lost starts going up and down between Durham and Tampa, but he's never had a "workhorse" kind of season. Wonder if he ever will.